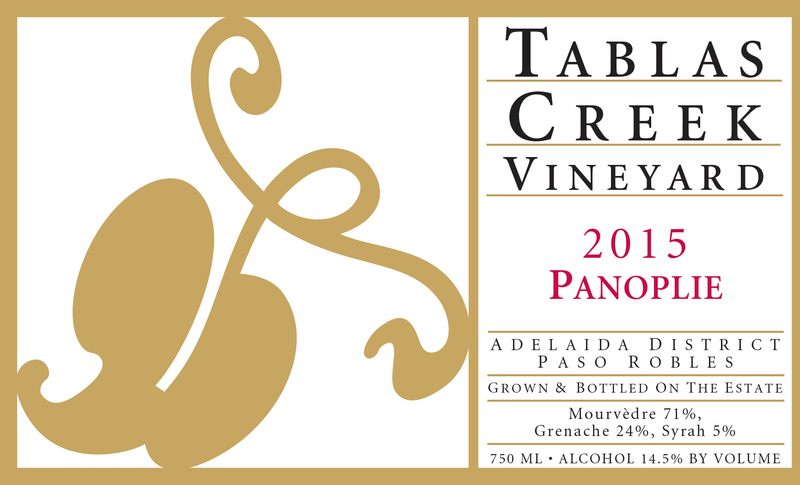 The 2015 Panoplie, rated 95-96 points by Josh Raynolds (Vinous) and 94 points by Lisa Perrotti-Brown (Wine Advocate) is available exclusively to Tablas Creek Vineyard’s VINsider club members. One bottle is included in the spring 2018 club shipment, with a limited opportunity for VINsiders to order 2 additional bottles. VINsiders who reserved this wine as futures in December, 2016 received their wine in the fall of 2017. Ordering the Esprit de Tablas and Panoplie en primeur is available exclusively to Wine Club members. In worthy vintages, Tablas Creek Vineyard produces small quantities of Panoplie: a Mourvèdre-based cuvée from meticulously selected grapes, made in the model of Château de Beaucastel’s Hommage à Jacques Perrin. In 2015, only 800 cases were produced. Vibrantly fruity and spicy on the nose, with notes of herby wild strawberries, orange pith, a briny mineral note, and a grilled meat depth that will only grow with time. The palate shows the characteristic lush texture of the 2015 vintage: mouthwatering ripe raspberry and cassis fruit, deepened by some brambly spice and lifted on the long finish with flavors of licorice, wild herbs and plum skin. Built to age, this wine has so much energy that it should drink well in its youth as well. We suggest drinking for its youthful vigor between 2018 and 2021, or for its meaty maturity starting around 2025 and lasting two decades or more. The 2015 vintage saw dramatically reduced yields from the combined effects of four years of drought and cool, unsettled weather during May's flowering. Months alternated between significantly cooler than normal and significantly warmer than normal, which produced an early start to harvest but required multiple passes through most vineyard blocks during a long, drawn-out picking season. Yields were down as much as 50% in early-ripening grapes like Grenache and Syrah, but later grapes like Mourvedre were only down slightly. The result was a vintage with excellent concentration and complexity from long hang-times, and wines with dramatic perfume, texture, and intensity. We harvested our Mourvèdre between September 24th and October 15th, Syrah between September 9th and October 5th, and Grenache between September 10th and October 8th. The grapes for our Panoplie were grown on our certified organic estate vineyard. The grapes were fermented using native yeasts in a mix of 1500-gallon wooden upright fermenters, open-top tanks and closed stainless steel fermenters. After pressing, the wines were moved into barrel and allowed to complete malolactic fermentation. The Esprit was selected from the vintage's best lots and blended in May 2017, then aged in 1200-gallon French oak foudres for another year before being bottled in June 2018.